Nuts are the first food that most people think to offer squirrels, but babies between 7 and 8 weeks old have complex dietary needs. It's also illegal to keep wildlife in most U.S. states, so if a baby squirrel needs help, take him to a squirrel rehabilitator, where he stands the best chance of survival. When there's no choice but to feed the squirrel yourself, puppy formula and vegetables are suitable foods. At 7 to 8 weeks old, baby squirrels are still drinking their mother's milk, so they need regular formula feeds. Puppy milk formula powder is the most suitable, mixed at a rate of 1 part formula to 2 parts lukewarm water for babies that are established formula-feeders, or 1 part formula to 4 parts water for recently-found babies, who may be at risk of dehydration, increasing to the full-strength amount. Other types of formula or milk, such as human baby formula, cows' milk, soy milk and goats' milk, are harmful. Between 7 and 9 weeks of age, baby squirrels drink between 6 and 8 cubic centimeters (one-tenth to three-tenths fluid ounce) of formula three times a day. Baby squirrels begin weaning, eating some solid food while still drinking mother's milk or formula, at between 6 and 7 weeks old. Rehabilitators put primate chow in the nest box to encourage the baby to try solid food, and add other foods over the next two weeks, such as apples, grapes, hard-shelled nuts out of the shell, broccoli stems, kale, green beans and other vegetables. Corn and sweet potato are included in the diet once the baby reaches 9 to 10 weeks. Baby squirrels who are weaning should be given as much solid food to eat as they want. Hamster and gerbil mixes aren't appropriate for squirrels. Squirrels eating an inadequate diet can develop a disorder called metabolic bone disease. Caused by calcium deficiency, symptoms include labored breathing, low activity levels and appetite, seizures, paralysis and finally, death. Metabolic bone disease is common among squirrels fed squirrel food products containing large amounts of nuts, corn and seeds. 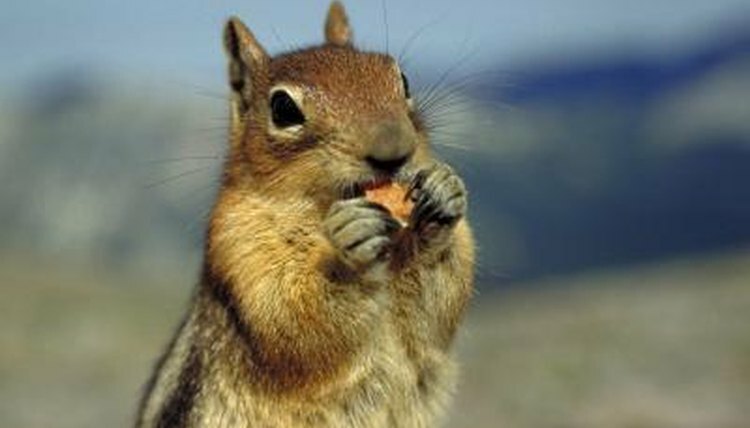 Although squirrels love to eat these foods, high levels in their diet makes them ill. If you suspect a squirrel may be suffering from metabolic bone disease, remove all inappropriate foods from his diet and take him to a squirrel rehabilitating center or vet. Water and warmth are more important to lost and abandoned baby squirrels than food. If you're unable to take the squirrel to a wildlife rehabilitation center immediately, warm him up and rehydrate him before offering food. Place a heating device, such as an electric pad or hot water bottle, covered with a blanket or towel, half under the squirrel so that he can move off if he gets too hot, and offer infant rehydration fluid by syringe. Don't squirt the fluid down the squirrel's throat, and always hold him upright to avoid liquid entering his lungs.